March Fourth sounds just like March Forth–what a fun play on words; for kids words build brain power. We might think words and action are opposites but brain-wise, the activity of words in the brain is mighty. Some fascinating research counted the number of words young children hear in a year. This, of course, varies depending on how much word activity there is in a family but the range is from over 3 million to 10 million. That’s per year! By the time a child is 4 years old and soon ready to start kindergarten, that total has now expanded to between 10 and 40 million words. No matter what the language is, the brain needs words. 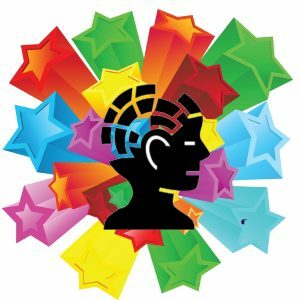 They help create pathways and connections in the brain. Just think how much information the brain receives in the form of words. The more words kids hear, the faster they process that information. Let’s look at those numbers again: 10 million words or 40 million. That’s a gap of 30 million words and it makes a similar gap in brain power. Have you ever heard the expression to “steal a march on someone?” It means to gain an advantage over somebody else. The kids who hear the 40 million words steal a march on those who only hear 10 million. Once kids get to school, we can see this in the simple act of putting a hand up to answer a teacher’s question. Do you remember kids who always seemed to get their hands up first? They may not have been smarter than other kids but their brains were faster at processing language. If we compare brains to car engines, these engines were not necessarily bigger but they sure were turbocharged. And that’s the power of words. Some practical ways to include words in your child’s day are to: read books, make up stories to tell, have conversations, and play. 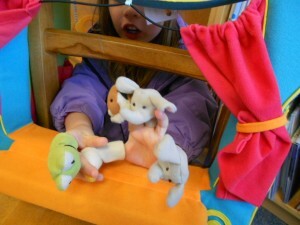 Puppets will use words, but so can other toys. Pick up a toy car and be it’s voice, “Oh, I am going so fast. I can zoom on the floor and go over the slippers. Ooops, I better be careful I don’t fall in. Oh, oh, it’s so dark in here. Now which way? Help, help.” Talk outloud during ordinary everyday actions such as getting dressed. For example, if your child’s pants are red, name other things that are red too, like stop signs, cherries, and traffic lights. Words build brain power and they help kids “steal a march” in terms of brain power and development? What are some ways you can add words to your child’s day and play? Not only are our brains prewired for stories, it seems as if our hearts are too. 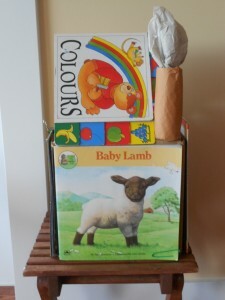 Yesterday’s post talked about the support for learning to read that reading books and sharing stories can give to child . But stories have a magic that can touch our hearts and tap into our emotions. A story can bypass the “No-to-Everything” of a toddler, the “but-I’m- my own-boss” of a preschooler, even the “my-parents-are-so-dumb” of an adolescent. Stories can weave the past, present, and future all together, going beyond time and space. Maybe that’s why they are so powerful. One reason why children’s brains develop so fast at this age could be because of the enormous challenge of all they things kids have to learn. Kids need to develop a basic knowledge of their bodies and how to make the parts work together. Emotions and feelings are on the inside making them even harder to figure out. Language requires lots of learning. Play is one of the ways that children learn and stories that they hear, or sometimes, tell themselves, are another. For a child who is afraid of monsters, the story about how daddy throws his stinky socks under the bed and the monsters all run away, can solve that problem. Having stories about kids who find it hard to cope with a new baby brother or sister can also help. There are stories about moving, being scared to go to school, dealing with teasing, parents who are divorcing, and kids having two homes, two moms or two dads. There are stories about ADD, autism, and other special needs or situations. 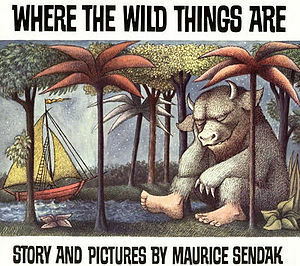 Goggle recognizes the importance of stories and had a delightful goggle-doodle animation of Where the Wild Things Are and other books by Maurice Sendak. Stories for kids often have fun and humor, something needed for a positive outlook. Recently, parent, author, teacher, story-teller, and college professor David Ward, shared his thoughts about the power of stories on my Learn and Play with Mrs. A radio show. During our conversation he mentioned that one of the most important elements to include in a story is hope, even or perhaps especially, for children. Have you used stories to help your child learn and grow? Did you know that human beings are hard-wired for story? Our brains crave stories as a brain-food and they are a powerful tool for all kinds of teaching and learning. As parents and caregivers we can use stories with children as another way to support their development. 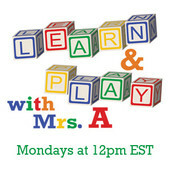 On my radio show Learn and Play with Mrs. A I’ll be talking to parent, author, teacher and college professor David Ward about kids and stories. The show will air Monday, June 10th at Noon ET. At the very least, simply reading to your child will prewire the brain for the challenge of learning to read. Stories will use far more words than kids do so just listening will increase a child’s vocabulary. Stories will use a wider variety of sentence structures familiarizing the ear to different language patterns and rhythms. Learning to read is a complex task and hearing hundreds of stories first, prepares the ground, much like we prepare the soil in the garden before planting the seeds. It isn’t hard to share hundreds and even thousands of stories with kids. Just 3 or 4 a day, several times a week makes a couple of dozen. That adds up to about a hundred a month, and over a thousand in a year. Hopefully, it’s not one story a hundred times, but that still counts. As kids hear stories, they understand that there is usually a beginning, a middle with a problem, and then an ending with a solution. This builds in an expectation that problems have solutions and that we can work on them to figure things out. Besides stories in books, we can tell stories to kids. I will confess that I told a story about a sock on the floor that wished to be in the laundry hamper with the other socks. It was so lonely and really hoped someone would pick it up and take it to be with some friends. Problems in stories can certainly be much more involved than socks left on the floor. Young children have lots to figure out as they try to make sense of the world around them. Stories are one way of supporting children to do that. What stories do you share with your child? Kindergarten Readiness – Is IQ More Important Or Attitude?